What better way to enjoy this Fall weather than going to a pumpkin patch? 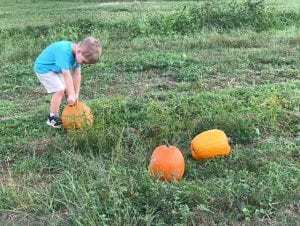 This is the last weekend to enjoy several pumpkin patches around the area! Check out the list for information and locations. Time: Saturdays and Sundays through October. Price: $10/person, 2 & under are FREE! Activities: Papa’s Playground Piperhorse, Rope climbs, horse swings, tire climb, land slide, playhouse, petting zoo, pumpkin patch & more! Activities: Admission prices include jumping pillow, cow train, two story play barn, walk through the maze, hayride to the pumpkin patch, Black Mamba slide, Lane’s Landsliiide farm animals, pig races, rubber duck races, sand pit, tire mountain, farm animals, 200ft zipline, spider web and more. Pony rides, corn cannon, and Gemstone Mine are not included. Pumpkins purchases are also additional. Price: Admission is free, pay per activity.